If you're an independent filmmaker looking for information on how to market, distribute and find audiences for your movies and videos, you'll discover it here. 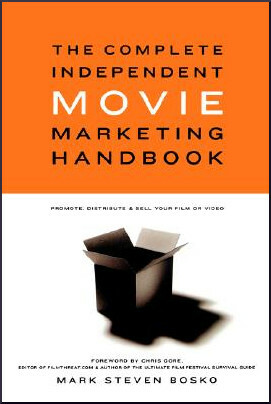 The Complete Independent Movie Marketing Handbook by Mark Steven Bosko — packed with street-smart savvy and real-world examples on how to promote and sell your productions — includes both traditional and guerrilla marketing techniques that'll make your film stand out in an ever-increasingly crowded marketplace. It's like having a highly paid film marketing guru at your side. From landing a distribution deal and getting free media coverage to staging a low-cost premiere and selling your movie to video rental chains and over the Internet, The Complete Independent Movie Marketing Handbook is a 'must-have' for any independent film or video maker looking to seriously launch and sustain a career in the entertainment industry. "Very well-written and full of common-sense advice that helps illuminate the often confounding independent film distribution process." — Nancy Gertsman, Co-President, Zeitgeist Films Ltd.
Mark Steven Bosko has been promoting and distributing independent feature films for more than 10 years. In addition to performing virtually every job on a film production, he has worked professionally in public relations, marketing, and magazine publishing.